Mish's Global Economic Trend Analysis: "Contained Depression"
Labor costs are the dominant inflation influence not only because they are the single biggest component of prices, but also because labor costs are heavily affected by compensation rates, which fuel consumer spending and are therefore tied to the ability of firms to pass on inflationary price increases to consumers. By contrast, oil prices, which are widely believed to be a critical inflation signal, have a weaker relationship to inflation over time, although they can be an important short-term influence. Labor cost inflation will remain subdued or even negative as long as unemployment remains high, and the prospects for a real recovery in labor markets are poor. A tightening labor market—a falling unemployment rate—would at some point trigger inflationary pay increases. Conversely, any unemployment rate that is substantially above such a trigger point indicates excessive competition for jobs and a tendency for pay raises to shrink—or pay cuts to become larger and more common. The trigger point, which varies from one business cycle to another depending on a variety of circumstances, is by any reasonable estimate far below the present figure of nearly 10%. I like the concept of a "contained depression". In addition, there is massive underemployment with 8.5 million working "part time for economic reasons" and another 2.6 million "marginally attached" workers who want a job but are not considered unemployed because they have not looked for 4 weeks. This is "containment" of sorts, as the official numbers mask the depth of the unemployment problem. Finally, countless millions have not paid their mortgage for months or even a year without being foreclosed on. Free from mortgage expenses but having a place to live certainly makes life a lot easier. I disagree with Levy when it comes to the issue of wage price spirals. 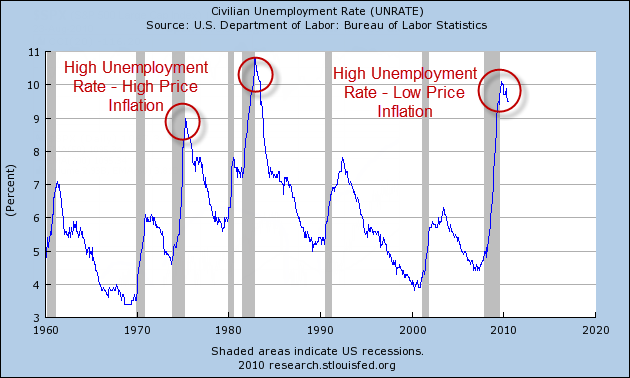 Levy's statement "Labor cost inflation will remain subdued or even negative as long as unemployment remains high" is not true as evidenced by the stagflationary 70's and 80's complete with Nixon's wage-price controls that were dismantled as a failure in 1974. The following three charts will prove my point. 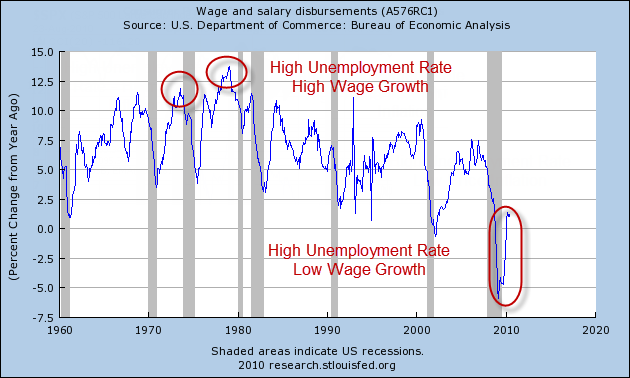 Clearly there is no consistent relationship between the unemployment rate, the CPI, and wages. Nonetheless, I believe Levy is correct about labor costs, for different reasons. Those forces will act as a huge damper on consumer demand for goods and services, a damper on business' ability and desire to expand, and in turn a damper on both wages and prices, regardless of what the Fed tries to do. The critical factor in that list is consumer psychology - the willingness and ability of consumers to take on more debt. In the 70's, households went from one wage earner to two, increasing the ability of households to take on debt. Interest rates falling from as high as 18% to where they are today increased the ability of consumers to take on debt. Belief that rising asset prices (especially home prices) would guarantee a nice retirement increased the willingness of consumers to take on debt, and debt they did take on in the form of second mortgages, home equity lines of credit, etc. Now, it's payback time for a global credit boom of epic proportion, now gone bust. Note the huge difference in the problems of Greenspan as compared to Bernanke. Greenspan had the winds of rising productivity in conjunction with an internet boom, followed by the winds of housing and commercial real estate booms, blowing at his back. The internet boom and the housing bubble both provided an enormous source of jobs. In contrast, Bernanke has a gale force breeze of a secular change in social attitudes towards debt in conjunction with unfavorable boomer demographics, blowing briskly in his face. There is no source of jobs now, only the hollow shells of vacant commercial real estate standing as testimony to the blatantly foolish policies of the Greenspan and Bernanke Fed. Inflationists simply do not understand the importance of these secular shifts in consumer attitudes and demographics. Greenspan was "lucky" in the sense that the credit booms fueled asset prices as opposed to consumer prices. Greenspan never had to act to contain "inflation" because he failed to see any even though it fueled a massive asset bubble in housing and commercial real estate. Here is a chart from Case-Shiller CPI Now Tracking CPI-U that shows what I mean. The above chart compares CPI-U vs. CS-CPI, the latter formed by substituting the Case-Shiller home price index for OER (Owners' Equivalent Rent), in the CPI. Home prices were relatively stable in the mid-to-late 90's as the real cost of borrowing was high. However, note what happened when Greenspan held rates low in 2002-2006. 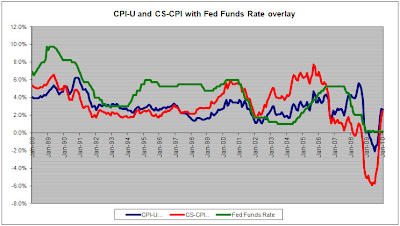 Real interest rates (subtract CS-CPI from the Fed Funds Rate) were as low as NEGATIVE 5% in 2004. Is it any wonder asset prices soared? This is one of many reasons why Bernanke's 2% "inflation" policy is preposterous. The Fed simply has no control where liquidity flows, or for that matter if there is a flow at all. Note that real interest rates as measured by CS-CPI hit POSITIVE 6% in 2009 in the wake of the housing crash. Ironically, talk of the town was "massive inflation". The above chart is from March 5, 2010. Although real interest rates are now negative by my measure, I do expect home prices as measured by Case-Shiller to start dropping this autumn, and for real interest rates to be positive once again, even at a 0% Fed Funds rate! Greenspan and Bernanke both failed to spot the massive increase in inflation in the early 2000's because liquidity flowed into assets as opposed to wages and consumer prices. We are now in the aftermath of the credit bubble bust. Just as rising productivity and rising asset prices masked massive inflation of money supply and credit in the early 2000's, the reported CPI-U masked falling home prices (and high real interest rates) from 2006 on. 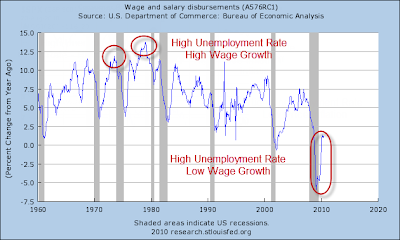 With consumers deleveraging, boomer demographics, and no driver for jobs or economic growth, wages and prices are highly likely to be contained. Thus, Levy has the result correct (deflation) but missed the key reason why - a secular change in consumer attitudes towards credit and debt in conjunction with a secular shift in the attitudes of banks' willingness to lend. The notion of an inexorable link between monetary policy and inflation is pounded into our brains by the prevailing economic wisdom: “inflation is a monetary phenomenon,” “inflation is too many dollars chasing too few goods,” “central banks pump money into their economies to inflate their way out of trouble,” and so forth. Yet creating more reserves in the system does not under all circumstances lead to additional demand, and if it does not, it cannot affect prices. True, under normal circumstances, easier money means lower interest rates, more credit creation, and more demand associated with that credit creation. But that’s not what happens when the economy faces what has been called the “liquidity trap,” when increasing the money supply does not induce more activity. There are various theoretical reasons given for the liquidity trap, but let’s just focus on what is happening now and what is likely to happen in the years ahead. Presently, excess reserves are not inducing lending for several reasons, and adding to them further will not make much difference. First of all, banks are capital constrained, not reserve constrained. Second, interest rates could not fall far enough during this business cycle to enable troubled debtors to refinance their way out of trouble, so now banks remain worried about the volumes of bad debt they are carrying and how future loan losses will impinge on earnings and capital. Third, deflationary expectations are beginning to work their way into banks’ loan evaluation process on a micro level; in more and more areas, loan officers are looking at households with shrinking incomes and firms with deflating revenues. Fourth, the private sector has too much debt, and many households and firms are trying to reduce debt, especially as more of them worry about deflation in their own incomes or revenues. Those four points above are perfectly expressed. In conjunction with secular changes in consumer attitudes, they form the very heart of the deflation argument. In spite of Bernanke's heroic efforts, banks are still capital constrained. The Fed can create reserves at will. It cannot create capital. Very few understand those alleged "excess reserves" are a mirage. They don't exist. More importantly, fewer still understand that reserves are not an issue at all and in reality, lending precedes creation of reserves. Australian economist Steve Keen has made a strong case that lending comes first and reserves later in Roving Cavaliers of Credit. I discussed that at length in Fiat World Mathematical Model. That point alone should seal the hash of the debate but it keeps coming up over and over. So let's try one more time. Inquiring minds are reading BIS Working Papers No 292, Unconventional monetary policies: an appraisal. Note: The above link is a lengthy and complex read, recommended only for those with a good understanding of monetary issues. It is not light reading. Simply put, anyone who thinks those "excess reserves" are going to produce haunting inflation simply has no idea how the credit system even works. What about the "Liquidity Trap"? My only point of contention in the above section by Levy is in regards to the alleged "liquidity trap". The "liquidity trap" concept is a Keynesian artifact that presumes something needs to be done about falling prices and lack of credit expansion. The reality is falling prices are a good thing (they are only bad in the construct of a credit bubble bust where banks can't be paid back and the Fed feels obliged to steal from taxpayers to increase bank profits to make up for their losses). Why inflation of monetary supply and credit of course. A depression is a necessary aftermath of a credit boom. Japan attempted to fight deflation for 20 years and all they have to show for it is debt to GDP ratios of 200% and an enormous demographic problem staring them square in the face. Contrary to Bullard's hypothesis that rising prices are desirable, we tend to think that most consumers would probably be quite happy to see falling prices. Note here that producers need not suffer either from a fall in prices. What is important for producer profits are relative prices. If their input costs fall to the same extent as their sales prices, they will continue to be profitable. Bullard's error is the widely held belief that falling prices are synonymous with economic depression. We already mentioned in the past that this view can neither be supported theoretically nor empirically. The fastest period of real economic growth in US history of the past 150 years occurred before the Fed was founded, and coincided with steadily falling prices. Since Bullard does simply not say anywhere why he thinks the price level should always be rising, he seems to assume that this is self-evident. However, it is not. If falling prices were bad for an industry, the computer industry would not be an engine of economic growth, but would always be in depression. Until Bullard explains how such an 'exception to the rule' can not only exist, but actually thrive, we fail to follow his argument in favor of more inflation. Also note, as I pointed out above, the Fed cannot control where liquidity flows or if it does at all. The housing bubble is proof enough. Thus, the idea that +2% CPI inflation is a good thing is doubly stupid. Although public debt issuance is massive at present and will continue to be so, total debt issuance— public plus private—is much smaller than it has been in recent years, and it will remain depressed. 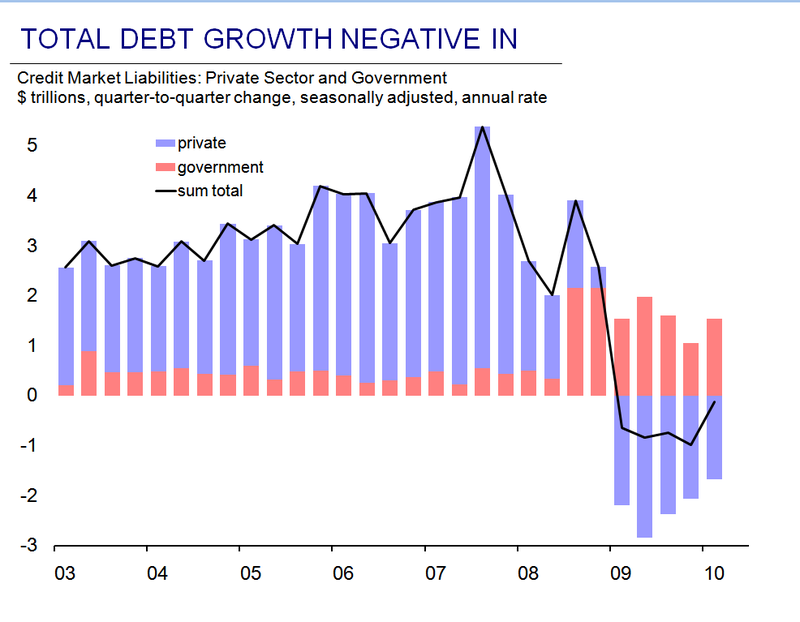 Public debt growth may have accelerated to roughly $2 trillion annual rate, but net private debt issuance will likely be minimal or negative for many years as the private sector delevers; private debt growth had been running at about $4 trillion annual rate in recent years but has shifted into reverse, becoming negative (chart 4). Thus, although the federal debt is rising rapidly, the total debt level in the economy is not. Note that net credit has been in contraction for 5 quarters! 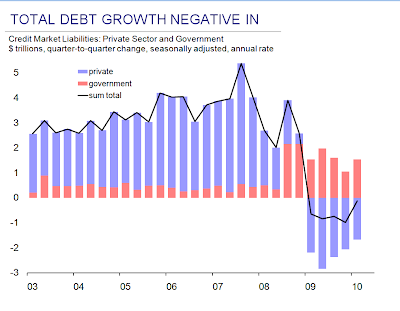 In spite of huge government deficits, private credit is contracting faster. Given that "excess reserves" just sitting don't do a damn thing, and given that TMS1 - True Money Supply is barely growing we have a rock solid case for saying deflation is here and now. 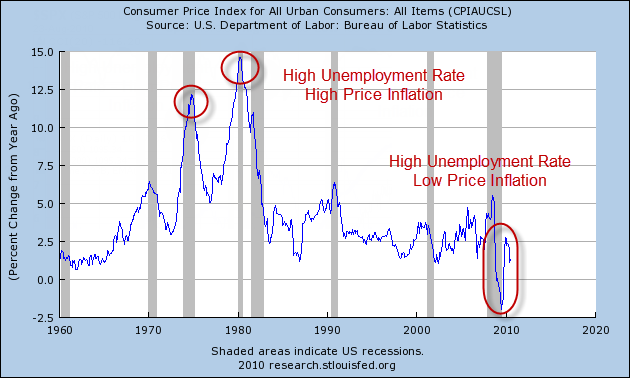 Rising prices do not constitute inflation, they are at best a symptom of rising inflation. 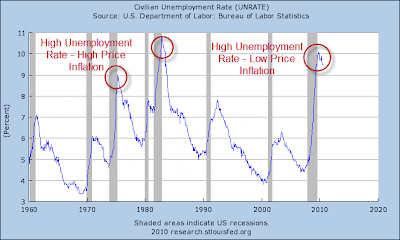 If you have not yet done so, please read Are we "Trending Towards Deflation" or in It? There is plenty of information in that article about how to spot inflation and deflation by looking at symptoms of inflation and deflation. Nearly every condition one would expect to see in deflation is happening, right now. The few that aren't are close at hand and likely. If all or nearly all the conditions one would expect to see in deflation are happening (the scorecard is close to unanimous), I suggest that those who say we are not in deflation have the wrong definition of the word. Bear in mind my definition of inflation is a net expansion of money supply and credit, with credit marked-to-market. Deflation is a net contraction of money supply and credit, with credit marked-to-market. Unfortunately, the Fed and the FASB have conspired to prevent mark-to-market accounting. However, it is relatively easy based on market reaction, credit expansion/contraction, and moves in interest rates to state that deflation started in 2007, continued through 2008, was interrupted in 2009, and we are back in it now, simply by looking at action in treasury yields in conjunction will all of the other indicator mentioned in the article. The reason I use "mark-to-market" accounting of credit in my definition is twofold. 1. From a practical standpoint "mark-to-market" accounting better explains what is happening and why. 2. The model is predictive. Note the Levy chart for 2008 and 2009. Asset prices crashed in 2008 and rose in 2009 although total credit fell in both years. Why? The massive bailout of banks by the Fed and Congress hugely lifted the value of credit on the books of banks. In turn, asset prices rose, as did treasury yields, even though the real economy stagnated. One could not have predicted recent events (even in hindsight) simply by looking at the Levy chart. The Levy chart shows 2008 to be an inflationary year and 2009 a deflationary year. One could also not have predicted what would happen to treasury yields without an understanding of what collapsing credit would do. Flashback January 20, 2008: Time To Short Treasuries? With rising unemployment will come still more foreclosures on both residential and commercial property. This will further impair bank balance sheets and any presumed recovery from this so called $150 billion "stimulus". It will likely take months, before that money gets into consumer hands and perhaps a year before Congress figures out it is meaningless. Note how useless the CPI and the price of oil were and still are, in predicting treasury yields. By the way, I love that Levy chart. Unfortunately, it is not possible to put together a chart of credit "mark-to-market". There is no such thing, on purpose. Neither the Fed, nor the banks want anyone to know true marks, and the accounting board has delayed "mark-to-market" accounting as well as rules that would require more off balance sheet transactions to be brought back onto bank balance sheets. However we can easily deduce the trend by a number of variables. Those variables suggest we are indeed bank in deflation after a short interlude in 2009. We have a model to look at and that model is Japan. Is debt-to-GDP rising or falling in Japan? I think we all know the answer to that. No doubt many will chime in "the US is not Japan" citing Bernanke's massive reflationary effort. Please consider Bernanke's Deflation Preventing Scorecard and my followup post Are we "Trending Towards Deflation" or in It?. Interestingly, a lack of savings in the US strengthens (not weakens) the deflation case. What cannot be paid back won't. What isn't paid back results in a collapse in credit (i.e. deflation). So yes, we are Japan, and no, this is not 1940. Levy makes another error in stating "The Rapid Increase In Public Debt Is Not Likely to End in Disaster"
Assuming we stay on the same course, we are indeed headed for disaster. However, timing the disaster and the nature of it is the problem. We could be 5 years away or 10. There are too many variables to figure out, and too many ways the problem can change in the meantime. I think Japan faces disaster first. They are one cycle ahead. 8. Could the Economy Begin to Overheat When the Contained Depression Is Over, Leading to Rapidly Rising Inflation? As long as the contained depression persists, and our best estimate is that it will last roughly a decade, the primary threat to price stability will remain deflation rather than inflation. Japan provides a graphic example of how an economy in contained depression — in Japan’s case, for nearly two decades — can run huge deficits, accumulate massive government debt, and still experience disinflation and deflation. 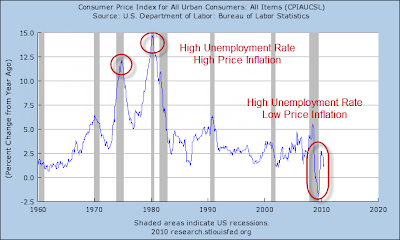 The real inflation question concerns what will happen once the contained depression ends. Although the future that far out holds many uncertainties, it appears that occasional spikes will be more likely than an ongoing upward wage-price spiral after many years of disinflation or deflation. Mish: Levy is back on track. I too suspect the "contained depression" may last as long as a decade. If it does, there is no reason to think the deficit will shrink. Japan's didn't, so why should ours? Interestingly, Levy hits the nail on the head with "Japan provides a graphic example of how an economy in contained depression can run huge deficits, accumulate massive government debt, and still experience disinflation and deflation" while stating something sounding way different in the preceding section. I commend Levy for coming to what I believe is the correct overall conclusion. Levy did go astray on some minor issues as well as one major point, but overall I like their analysis. The report was well presented. One problem in reading the report is that at times Levy seems to confuse "price inflation" with "inflation". It is very difficult to draw correct conclusions about what is happening and more importantly what is likely to happen, unless one figures out where money supply and credit are headed, and why. If you have not done so, please consider Fiat World Mathematical Model. That Levy managed to come to what I believe is the proper overall conclusion stems from Levy's rock-solid case presented in section 2: Why Aggressive Monetary Policy Isn’t Causing and Won’t Cause Inflation. It is not often that economists ask me for an opinion on their works. I appreciate this opportunity by economist Kevin Feltes to comment on the works of the Jerome Levy Forecasting Center.